The reason the walk is 6 km is that is the average distance that women and children (mostly) walk in the developing world to get to water each day (or multiple times a day)—often to get to dirty water. Dirty water and a lack of water are leading causes of disease and death. Walking for hours each day often prevents children from going to school or from keeping up with their class, and prevents women from doing other productive work (time poverty). And walking for miles often puts women and children at risk of assault or injury. World Vision is the largest provider of clean water to poor people in Africa. They do not fly in and leave a well behind, they develop a relationship with a community (usually using a local World Vision employee from that culture) and train community members to maintain and repair the well. World Vision wells have a track record of continuing to work for years or decades after being installed—because the community feels pride and ownership in them and keeps them maintained and in good repair. At First Pres, we are so excited to get to partner in this work—each well that is built changes the lives of the whole town—stopping disease, freeing up hours a day for women and children to work, play, go to school and more, providing important, meaningful work to community members, and protecting the most vulnerable from predators. This is the second year that FPC has hosted. Last year we raised over $5000, providing clean water for life to over 100 people!! Jamie White has been the Director of Youth Ministries at Mount Olympus Presbyterian Church for 15 years. Over that time she has touched many lives and even more hearts. Jamie leaves Utah for Princeton this fall. She will be missed tremendously. On behalf of the Presbytery of Utah, thank you for your service and may you encounter many blessings on your way. You can view the job description and application at http://www.mountolympuschurch.com/about-us/jobs. Please forward this to anybody you believe would be a great addition to the Youth Ministry team at Mount Olympus. The application deadline is April 17th. 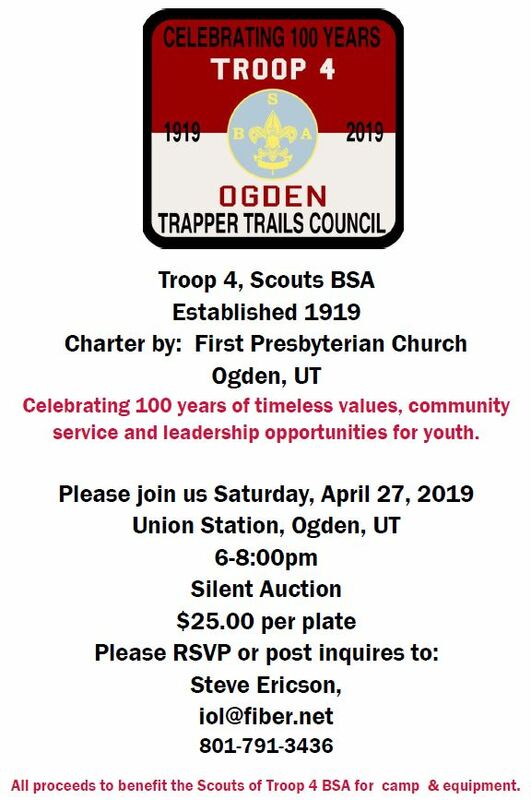 The Boy Scout Troop 4 in Ogden, Utah is turning 100 years old this spring. The troop was chartered at First Presbyterian Church has been meeting there since its inception in 1919. Troop 4 is having a dinner and a silent auction fundraiser for camp and equipment for the Troop Scouts on April 27th.